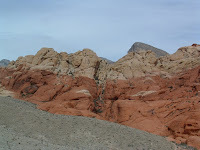 TravelnWrite: Just west of Las Vegas we hit the Jackpot! Mother Nature provided this win just a few minutes drive and a world away from Las Vegas. Because we had a rental car for the road trip from Santa Barbara, we were able to get away from The Strip and see what else Vegas has to offer. It may have been the first time we visited the Red Rock Canyon National Conservation Area but it certainly won't be the last. And next time we'll bring our hiking boots! Visiting the Canyon on an early Saturday morning, we paid the $5 federal entrance fee and then joined a parade of cars winding our way through the canyon on a 13-mile, one-way scenic loop. Shutterbugs like me couldn't resist stopping at each of the overlooks scattered along the route and conveniently each overlook provided ample parking - a plus for Joel, the driver. There are some 19 hiking trails that lead off into the canyon from the overlook parking areas, ranging from easy walks to more 'strenuous' routes both in terms of distance and elevation changes. Having arrived without food or drink, we skipped the picnic area at Willow Springs about half way through the drive. It's a fabulous setting though for outside dining. And climbers around the world come here to hoist themselves up and down the sheer rock surfaces on more than 2,000 rock climbing routes. Permits are required to climb. 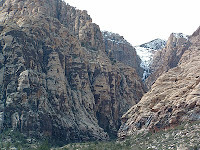 Managed by the Bureau of Land Management the Red Rock National Conservation Area encompasses nearly 200,000 acres. You are reminded of the expansiveness from several points along the scenic route. A new Interpretive Center has just opened and is a good place to start your visit. I love Red Rock Canyon. Kind of rests the eyes and ears after being on the strip, doesn't it?